The IEC 320 C14 Plug to C13 Connector Power Distribution Unit (PDU) power cord are commonly used to connect a PDU and computer in a data cabinet. 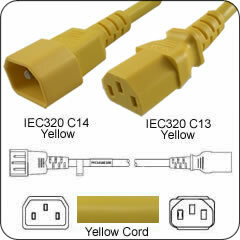 This 8 Foot Yellow 10 AMP power cable will allow you to distinguish the cord in a high density installation. In data environments keep length of cords to a minimum to avoid contact with Ethernet cables.